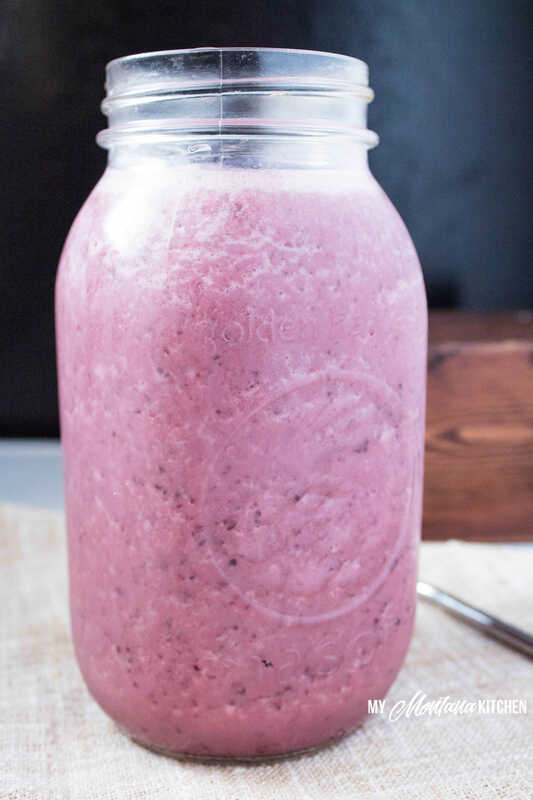 A refreshing low fat smoothie made with double fermented kefir and flavored with sweet ripe cherries. Kefir is my new thing. I tried it back in the fall of last year – ordered some grains from Amazon, and made kefir for a few weeks before I killed my grains. Oops! We went away for a weekend and I forgot to put my grains in the refrigerator to slow the fermentation process. When we returned, my fledgling grains were gone. My friend gave me the grains and I packed them carefully (in their bag with milk) in a small plastic container for our flight home. Little did I know it would take 3 tries at the airport before we would FINALLY leave (long story – our vacation ended up being few days longer than we had planned)! After all of that, I wasn’t sure if my grains would have survived, but they did! And they have done marvelously! I really think it helped that the grains were already well established when they were given to me. I have made gallons of kefir since then, and I’ve even started a few other families on campus with their own kefir grains! My husband and I work at Northwest Indian Bible School, a school for Native American young people. We are the boys dorm parents – so we are their “Mom and Dad” away from home. Two of my dorm boys have started drinking kefir every day! If I am going to be away, they ask that I leave some for them! I’m happy to oblige – kefir is bursting with so many benefits! Now, you may be asking, exactly what is kefir, and what ARE the benefits of a kefir smoothie? For more information, and to see his awesome infographic, check out Dr. Axes’s post about kefir. 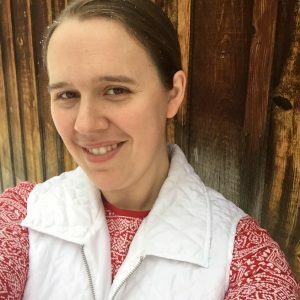 If you are unsure how to make kefir, here is a great tutorial made by Pearl and Serene (authors of the Trim Healthy Mama books). Here is another easy video tutorial. For Trim Healthy Mamas, kefir can be different fuel types depending on several different factors. You can buy kefir in the store – both low fat and full fat varieties. Or you can make it yourself at home using kefir grains. Your kefir can be made with either whole milk or skim milk. And the fuel type changes if you double ferment your kefir, since the double fermentation reduces the carbs and natural sugars even further. Below, you will see the breakdown of fuel types. To double ferment your store-bought kefir, simply leave it (unopened) on your counter for 24 hours, then place in your fridge. Whew! I hope that didn’t confuse you too badly! I usually buy skim milk to use for my kefir. I always do a double fermentation, so I have FP kefir to use in my shakes and kefir smoothies. For this recipe, you will want a low fat kefir or the FP kefir option, since we are adding cherries (a carb source) for an E fuel. 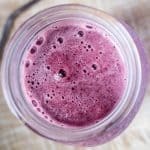 You can add any fruit to this kefir smoothie, but I love the cherries. And did you know that sweet red cherries promote the production of melatonin, which helps you sleep? This would be an awesome evening snack! 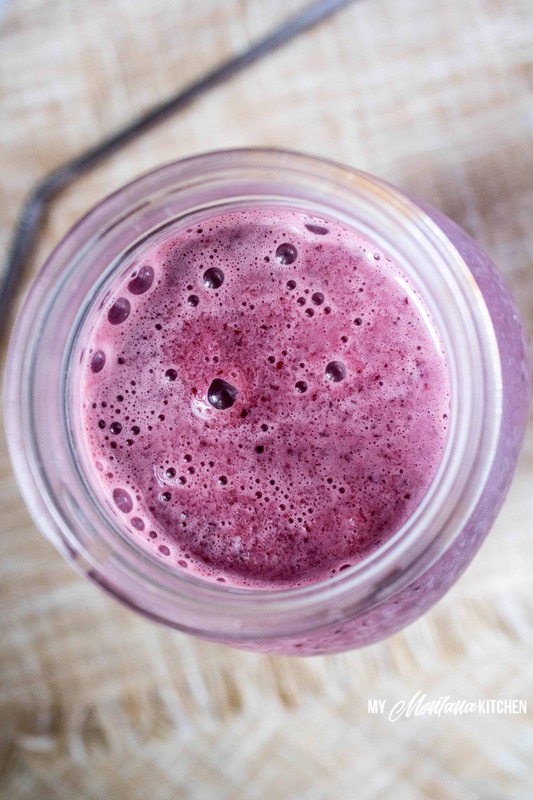 So, what do you need for this Cherry Kefir Smoothie? A quick note about the photo above – if you make the recipe exactly as stated above, it does not quite fill a quart jar – more like 3/4 of the way full. To make a full quart you can add more kefir or unsweetened almond milk. Place all ingredients in a blender and blend well until all ingredients are combined. I personally omit the ice in my smoothie. You can use any fruit in place of the cherries, but that may change the fuel type, as well as the nutritional information. You can use store-bought low fat kefir, but it will increase the carb count. You can double ferment your store-bought low fat kefir, and that will make it a FP (as used in this recipe). I was hoping you could answer my question about kefir. I’m new to making my own (also skim milk), but when I double ferment it it separates into curds and whey. What am I doing wrong? You may be fermenting too long. I used to double ferment 24 hours and that’s what mine did. Now I only double ferment a couple of hours and it doesn’t separate. My question is at what point do you know it has double fermented? Generally, you are supposed to let it sit for 24 hours, but if mine starts to separate a lot, I call it done then (sometimes after 12-14 hours). I’m certainly not the expert on this, though, so I may be mistaken. I know we don’t count calories in THM, but I am just wondering if double fermenting changes the calories at all? I haven’t tried this cherry smoothie yet, but it looks amazing! Yes, it does reduce the calorie amount. I took that into consideration when calculating the nutritional information. I’m having a hard time finding frozen cherries. My Walmart doesn’t have them. Any suggestions as to where to get them? I also buy them at Target – a chain grocery store may also carry them. This is delicious! I made it without the ice. I might add 1/2 scoop of chocolate whey protein powder next time, just to get a new flavor. My concern is the carbs. What is posted is way to much for a diabetic. Will double fermenting reduce the carbs, if so, how much? I’d love to make this, it looks awesome. You can use strawberries instead. That would turn this into a FP instead of an E Fuel.